We visited these two islands on April 30 & May 1. But before getting to them I am going to introduce you to our last set of table mates, who all boarded in Rome & were with us until we reached Fort Lauderdale. It was a diverse group judging by residence: Linda & Doug live in Waco, Texas; Tish & John live on Long Island; Anne & Jim live in the Bahamas. We were lucky again to have a table full of interesting & enjoyable people, a circumstance that can really make a difference on a cruise, and we had a very good time together. One of these pictures was taken by Doug, for obvious reasons. It was formal night or we wouldn’t have been dressed like that! So as I said before, we arrived off Alghero, Sardinia (Italy) on the morning of April 30. Unfortunately, the captain decided the sea was too rough to tender ashore so we didn’t get to visit the town. It was misty & the sea wasn’t entirely calm, but it didn’t look that bad to me, but of course it was not my decision to make and if I were responsible for the well-being of all these folks I might look at it differently. 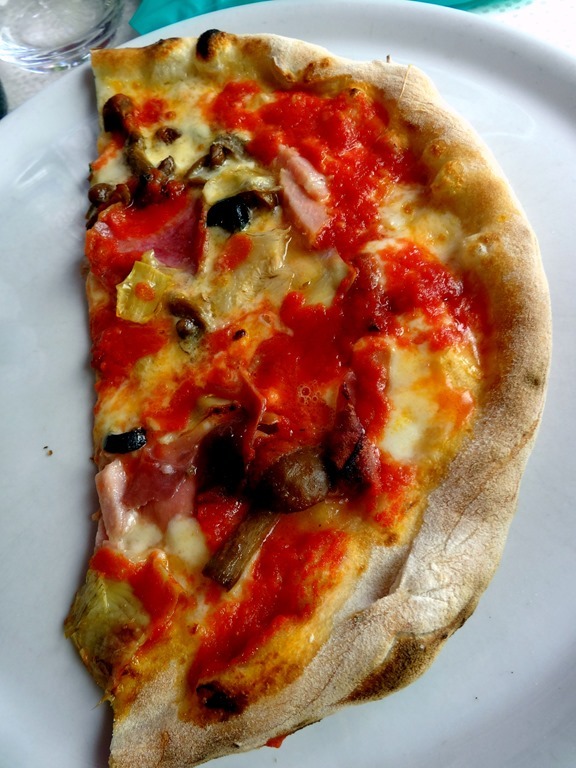 I guess if we had to miss one I would rather it be Alghero than Rome or Athens, but we were disappointed because Sardinia is a place we might never get back to. Anyway, all I have is pictures from the ship. The first two were taken before we reached Alghero & I thought they were of islands or remote cliffs, but it turns out that at least one of them (the second one) was of a place called Capo Caccia not far from Alghero, which is an area full of underwater and partially submerged caves, the most famous of which is called Neptune’s Grotto. On May 1 we arrived at Mahon, the capital of Spanish Menorca (or Minorca) in the Balearic Islands. Today this is essentially a resort town, but it has a very long & involved history. The city is thought to have been named after Hannibal’s brother Mago Barca who took refuge here in the 3rd Century BC. It has been part of the Roman & Byzantine empires, ruled by the Moors of Spain & the French, and was independent for a period as well. Looking at this placid waterside city you would never guess that it more than once it has been plundered and its entire population slaughtered or sold into slavery, once in the 16th Century by the pirate Barbarossa (“red beard”) operating under the auspices of the Ottomans. Many of its citizens are descendants of Catalans who settled here while Menorca was under the rule of the kingdom of Aragon in Spain, & Catalan is the primary language here. The island was ruled by the British during most of the 18th Century & Mahon still displays its legacy of Georgian architecture. Mahon is also reputedly the birthplace of of the salad dressing called mayonnaise. Right next to the ship was the grand staircase & S-shaped road that are the main entrance to Mahon from the dock. It was a steep climb but we made it up OK.
At the top of the stairway is a large attractive plaza, Placa Espanya. One can look down from there on the cliffs & stairway & harbor. On one side is the 18th Century Iglesia del Carme, which I think is a cathedral. Unfortunately we were there on Spanish Labor Day so most things were closed, including this church. In fact the whole city seemed pretty abandoned. But in the old cloisters of the church is a marketplace called Mercat del Claustre del Carme that was open, although pretty quiet because of the holiday. There was a nice large courtyard surrounded by the church & the market in which movies are shown on summer nights. Not far away, just beyond the other side of Placa Espanya, is the Church of Santa Maria. It was built in the 13th Century & renovated during the British occupation in the 18th Century. It is a nice church, but its best feature is its pipe organ, sporting 4 keyboards and more than 3,000 pipes, which was transported precariously across war-torn Europe in 1810. There are organ concerts in the summer but not when we were there. We walked around town for a while. The Georgian architecture is less than exciting, although I have read that this is the only place in Spain where you will see it. The streets were pretty devoid of life, apart from Prinsendam folks wandering around like we were. We did see the Teatro, or opera house, looking rather plain from the outside although it supposed to be opulent on the inside (yes, it was closed). And we saw the Puerto de San Roque, a 14th century gate to the city that is all that is left of the walls built to protect the city from pirates and invaders. We walked to an overlook on the edge of the cliff near our ship, beneath which was a narrow road that zigzags down to the port level below. Having seen enough of this pleasant but unexciting town, we walked back down the stairway, noticing the nice fauna by the cliffs on the way, and had a late lunch on the ship. We left in late afternoon. Mahan’s harbor is 3 miles long & is the second deepest natural harbor in the world. It was one of the most important, and most fought over, harbors in the Mediterranean for many hundreds of years. Sailing through it feels more like being on a wide river than in a harbor. On its shores are military fortresses, wealthy homes, waterfront housing developments and a good bit of scenery. We passed by Hospital Island on which sits one of the oldest Royal Navy hospitals in the world, built early in the 18th Century & used until 1964. In the 13th Century King Alphonso III landed on this island to begin his successful campaign to take Minorca from the Moors. We also saw Illa del Llatzeret on which is a large fortified quarantine hospital built in the 18th Century. This was a peninsula until about 1900 when a canal was dug to turn it into an island so it would be more difficult for infectious patients to escape. The hospital closed in 1917. We also saw Fortaleza del Mola, built by Spain in the 19th Century to defend the harbor. Actually, a hilltop fortress is visible in several of these pictures that may be different views of Fortaleza del Mola. Finally we sailed by the steep rocky cliffs at the mouth of the harbor & into the Mediterranean. This was our last night with Kiki, who had been our waiter at dinner (and often at breakfast) since we left Fort Lauderdale. He is a delightful fellow, quick with a quip and a smile, whose company we really enjoyed. He really made a difference for us on this lengthy cruise. He was leaving the ship in Barcelona for a well deserved vacation at home with his wife and lovely baby daughter. 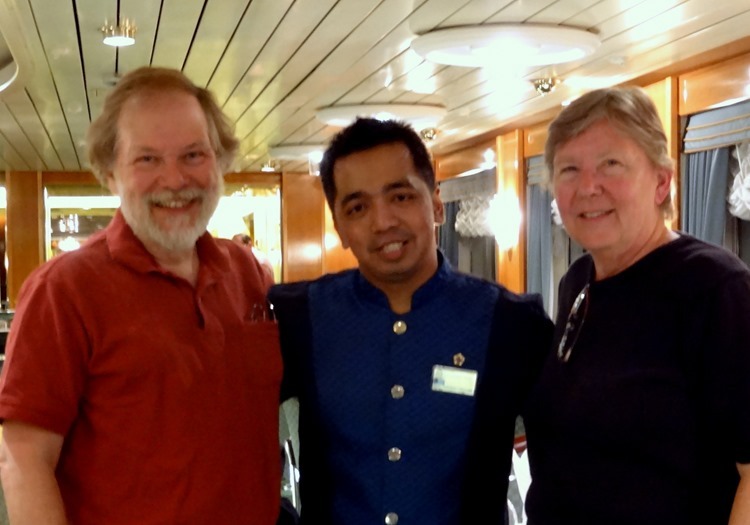 We hope he had a wonderful time & that we will meet him again on a future sailing. That’s pretty much it for our stay in Menorca, which was more about relaxing than sightseeing. But Barcelona is next, which will not be like that at all. We haven’t had any towel animals or food sculptures in a while, so I will leave you with a few of those. 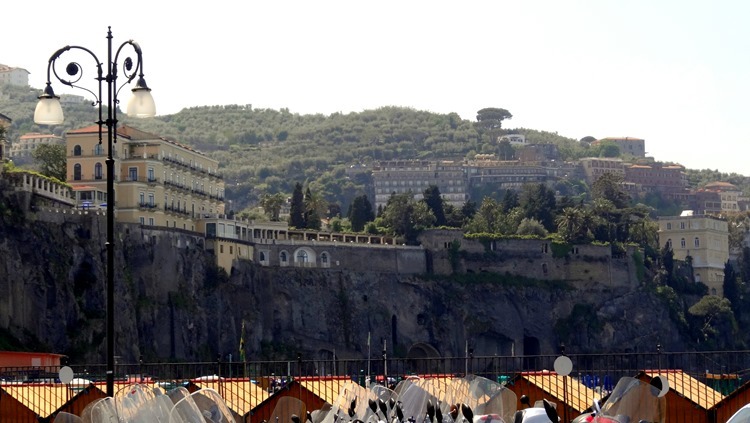 Sorrento is just on the other side of the Bay of Naples, so it was a short hop for Prinsendam and we arrived early on the morning of April 28. Founded by the Greeks, it was named after the Sirens in the Odyssey who failed to lure Odysseus to crash his ship into the cliffs supposedly on this spot. Thinking they had lost their powers (he had actually tricked them) they committed suicide by throwing themselves on the rocks, which made this area habitable. 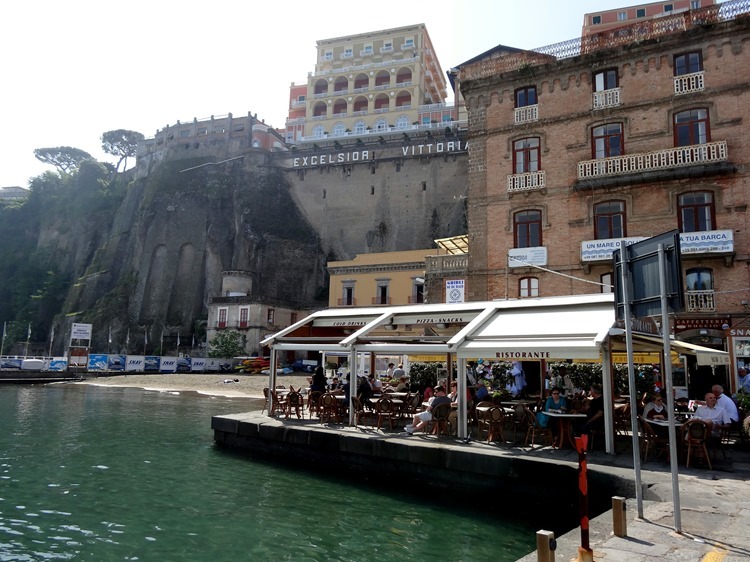 The previous day in Naples, with touring Pompeii in the rain, had been pretty tiring so we decided to make Sorrento a leisurely stop, particularly since there wasn’t anything there we felt we had to see. This worked out great, since we had a nice day and Sorrento is a nice small (16,000) city for just walking around & soaking up the ambience. So we started the day by sleeping a little later & having a leisurely breakfast in the main restaurant, then we went out on deck for some pictures & took the tender to Marina Piccola, the (yes) tiny port at the bottom of the cliffs on which the city is situated. Fortunately, HAL had a shuttle bus to take us up the hill to Tasso Square, which is the center of town, because it is a steep climb. This was a very nice plaza, with several large outdoor cafes & a statue of St. Antonino (St. Anthony), the local patron saint whose relics are in a basilica near the statue, in the middle of the street. But the best thing is that this square was built over a large gorge that cut in through the cliffs from the sea. Before this plaza was built in the 19th Century the gorge divided the city, so the part of the city to the right is the ancient Greek city while the part to the left (beyond St. Antonino) was farmland before the square was built, There are buildings sitting precariously on the edge of the gorge with great views. I tried going into the gardens of one but was politely informed that this was private property and I was not welcome. Hmpf! We walked on toward the Via Santa Maria della Pieta, a street built several centuries BC. 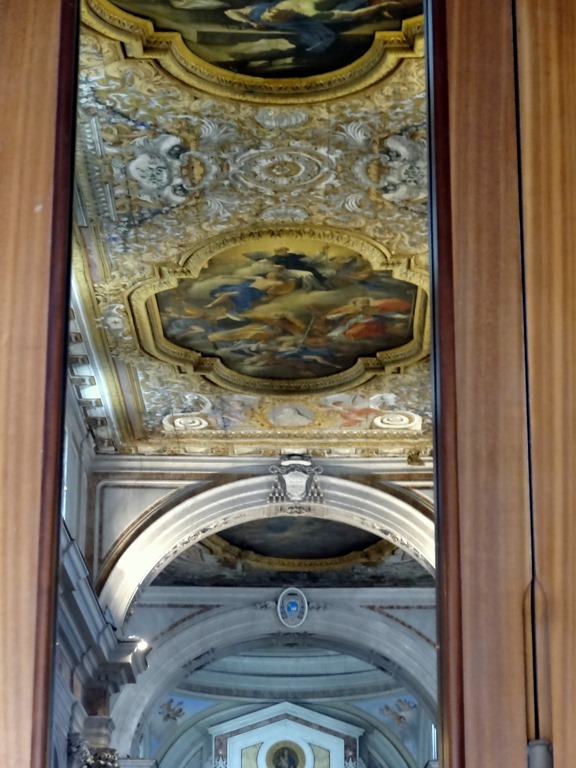 We went into the courtyard of the Palazzo Correale, said to be typical of 18th Century aristocrats. We also saw a small shrine to Mary, closed but you could see the picture and flowers through the door. There is supposed to be a 13th Century palace on this block as well but we must have walked right by it, not noticing anything that looked palace-like. Next we came to the Duomo, the cathedral of Sorrento. It was Sunday and they were having services so we didn’t go inside, but I took pictures of the beautiful inlaid wood doors (inlaid wood is a specialty of this region) & the elaborate ceiling from the entrance. There was also a lovely reddish clock tower, which I think was on the other side of the courtyard from the Duomo. Next we came to the Sedile Dominova, an 18th Century building that was once the meeting place of the city’s nobles and is now a men’s club. The outside has beautiful old frescoes, again with effective simulated 3D. And there was a local band playing in front of the club’s loggia. 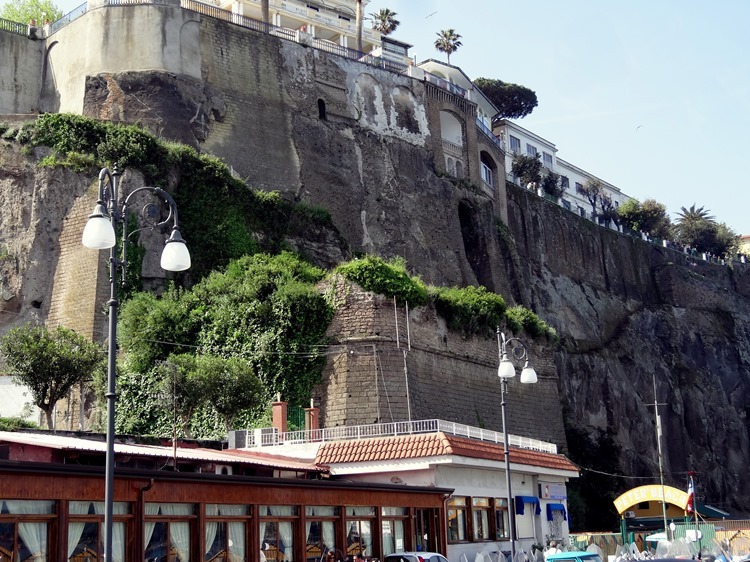 We continued strolling around the charming streets of Sorrento. 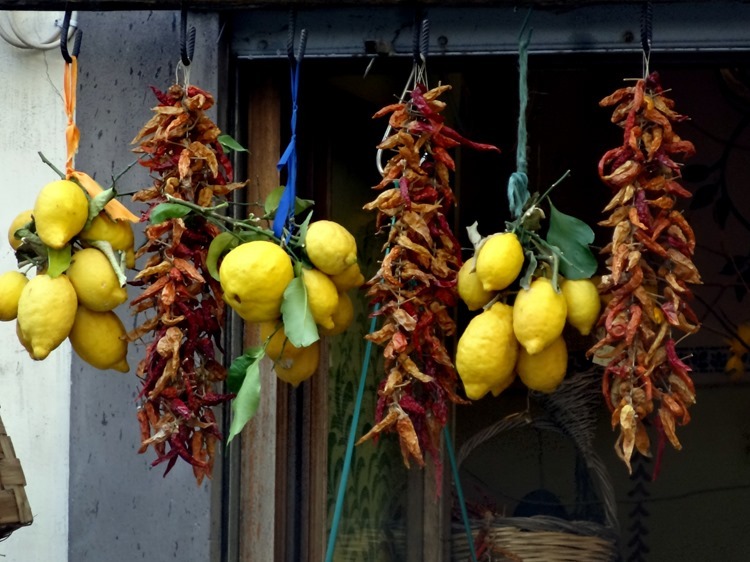 One of the things Sorrento is known for is lemons, and we saw a whole lot of them in all shapes and sizes, in stores and outdoor stalls. They are also loaded with lemon product, like soap & ceramic lemons & a liqueur called limoncello. It was Sunday, so there were a lot of townspeople on the streets after services along with the cruise folks and other tourists. So the streets were the opposite of deserted. Sorrento was also full of beautiful flowers and other flora of all varieties. After a leisurely & enjoyable day we took the tender back to the Prinsendam. It occurred to me that I had never posted a picture of the inside of a tender, so here are a couple. Not luxurious (or even comfortable), but its good enough for a short ride. I will leave you with a few pictures of interesting parts of the Sorrento cliffs taken from the ship before we sailed in the evening.